Time to take a break from politics and sociology and geek out about quantum mechanics for a while. What distinguishes this "riff" on a traditional Michelson interferometer is that the mirrors that reflect one of the beams (the one drawn in green) are mounted on a trolley that allows them to be moved as a unit to an arbitrary distance. We use this capability to make the distance traversed by the photons on the green path be much larger than those on the red path, large enough that there is an easily measured difference in the travel time between the two paths. Let's call the time it takes to traverse the red path T1 and the time it takes to traverse the green path T2, with T1 much smaller than T2. So we turn on the laser. What can we expect to see? Well, the laser beam is emitted at the speed of light (obviously). After time T1 the red-path photons arrive, but the green-path photons are still en-route, so we should see no interference. Then at time T2 the green-path photons arrive. What happens then? If we do this with a standard interferometer (or two-slit experiment) where the path-lengths are very nearly the same, we still see interference even when the photons go through one at a time. This is the famous and mysterious phenomenon of quantum superposition, where each individual photon "goes both ways" and interferes with itself. But with this setup, "interfering with itself" would seem to be impossible. Yes, the photon goes both ways, but how can it possibly interfere with itself when the differences in travel times between the two paths are so large? By the time the red-path-part of the photon arrives at the detector, the green-path part is still en-route to the distant mirror. Likewise, by the time the green-path-part of the photon arrives at the detector, the red-path part is long gone. So individual photons can't possibly interfere with themselves in this setup, and so large numbers of photons should not be able to produce interference either. 3. There is interference after T2 even when the laser is dim. In which case the question becomes: how? The answer next time. It turns out that this thought experiment has some pretty profound implications with respect to the interpretation of quantum mechanics. As far as I can tell from a cursory search, I'm the first to propose it, though I would be surprised if that actually holds up to scrutiny. If anyone knows where this has been analyzed in the literature I'd appreciate a pointer. I believe experiments along these lines have been done using an optical cavity to delay the light in one arm of the interferometer. But I'm unable to find a reference right now. From the photon's perspective, isn't it everywhere on its trajectory at the same time? Yes . But that doesn't explain how to reconcile this from *our* reference frame. 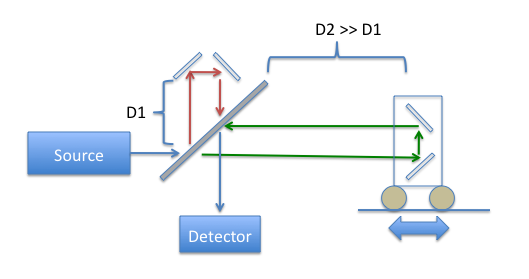 > Is delay line interferometer or Time-Delay Interferometry relevant? Yes, insofar as I'm talking about the same kind of device. But my experiment is very different in character and purpose from the ones described in those links. You're mostly right. Second-order interference does kinda-sorta pop up in the answer, but the whole point of this exercise (as you will see when I give the solution) is to be able to safely ignore second-order effects. A photon being "everywhere on its trajectory at the same time from its point of view" is not quite accurate because a photon doesn't really have a "point of view" (the technically correct way to say that is that there is no inertial reference frame corresponding to the photon's location). In the limit as a particle moves faster and faster and approaches the speed of light, the distance between its source and destination gets shorter (in its reference frame) and the time it takes to get from A to B gets correspondingly smaller. But you can never actually *reach* this limit. But all this is a red herring because you can do the exact same experiment with electrons. > Does de Broglie and Bohm's pilot wave theory help at all? I'm also not convinced that this notion of timelessness is (i) incoherent; or (ii) necessarily irrelevant to the current issue. Ron's response to you (including, importantly, his footnote ) was correct. A photon's worldline is null, meaning the spacetime interval between any two points on it is zero. But for that very reason, you cannot interpret this interval as a "time". The more technical way to say this is that, for a timelike worldline, you can parameterize the worldline by its arc length, which is just the proper time along it; the fact that you can do this is what justifies interpreting the arc length as "time". But for a null worldline, you can't parameterize it by arc length, so there is no way to justify that interpretation as there is for a timelike worldline. > > Does de Broglie and Bohm's pilot wave theory help at all? > Luke: Or is there a formal proof that the pilot wave could not possibly matter? Anyhow, I'm pretty sure "an external reality exists" violates Ockham's razor. > > I'm also not convinced that this notion of timelessness is (i) incoherent; or (ii) necessarily irrelevant to the current issue. > Ron's response to you (including, importantly, his footnote ) was correct. A photon's worldline is null, meaning the spacetime interval between any two points on it is zero. But for that very reason, you cannot interpret this interval as a "time". I'm not sure how you're disagreeing with me; I wrote "timelessness". > Ron: But all this is a red herring because you can do the exact same experiment with electrons. It isn't a red herring if you can think of mucking with the pilot wave and have that produce predictive results. I'm reminded of a physics class I took where we talked about trying to observe "which way" for the classical two-slit experiment with electrons. As it turns out, shining light at the two slits gives you a precise trade-off: the more confident you are in "which way", the less interference pattern you got. This is all statistical; one interpretation is that when you measured "which way", those photons became localized (yes yes: wah wah nonlinearity) and thus exhibited no interference pattern. It's here that Which-way detector unlocks some mystery of the double-slit experiment becomes neat. They did a "which way" detector and found that what really destroys the interference pattern is inelastic scattering. This just makes me want to explore weak measurement and interaction-free measurement. If you meant something different, I don't know what you meant. It isn't a red herring if you can think of mucking with the pilot wave and have that produce predictive results. This won't help with photons, because the pilot wave model is non-relativistic, and photons are inherently relativistic; there is no non-relativistic approximation for them. you can't interpret the zero interval along a photon's worldline as a "time"
(a) The time along the photon's worldline is zero. (b) The photon is timeless. It means the concept of "time", or anything involving "time" (including "timeless") does not apply to photons; none of those terms even make sense at all for photons, they're meaningless. The concept of "time" applies to inertial observers who are observing photons, but those observers will always observe photons to take a non-zero time to travel a non-zero distance in space. So there is no viewpoint in which photons are "timeless". Consider this: a photon is emitted by a source, travels some distance D to a mirror, which reflects the photon back to its source. If it were legitimate to analyze this process "from the photon's point of view" you would conclude that no time passes from the time the photon is emitted to the time it returns. > Consider this: a photon is emitted by a source, travels some distance D to a mirror, which reflects the photon back to its source. If it were legitimate to analyze this process "from the photon's point of view" you would conclude that no time passes from the time the photon is emitted to the time it returns. So Einstein was an idiot for ever trying to think "from the photon's point of view"? Do you know what Einstein concluded by trying to think "from the photon's point of view"? He concluded that "the photon's point of view" doesn't make sense--whereas, according to Newtonian mechanics, it should. And that was one of the key insights that led him to special relativity. > > > Consider this: a photon is emitted by a source, travels some distance D to a mirror, which reflects the photon back to its source. If it were legitimate to analyze this process "from the photon's point of view" you would conclude that no time passes from the time the photon is emitted to the time it returns. > > So Einstein was an idiot for ever trying to think "from the photon's point of view"? > Do you know what Einstein concluded by trying to think "from the photon's point of view"? He concluded that "the photon's point of view" doesn't make sense--whereas, according to Newtonian mechanics, it should. And that was one of the key insights that led him to special relativity. @Luke: "how sure are you about that"
Einstein, "Autobiographical Notes", pg 49: "...a paradox upon which I had already hit at the age of sixteen: If I pursue a beam of light with the velocity c (velocity of light in a vacuum), I should observe such a beam of light as an electromagnetic field at rest though spatially oscillating. There seems to be no such thing, however, neither on the basis of experience nor according to Maxwell's equations. From the very beginning it appeared to me intuitively clear that, judged from the standpoint of such an observer, everything would have to happen according to the same laws as for an observer who, relative to the earth, was at rest. For how should the first observer know or be able to determine, that he is in a state of fast uniform motion? One sees in this paradox the germ of the special relativity theory is already contained." The quote Don Geddis gave is one of many you can find if you read much about Einstein. There is a good account in Kip Thorne's *Black Holes and Time Warps*, with a number of references to primary sources; Thorne also discusses in more detail the physics involved. The basic idea, as you can see from reading Don Geddis' quote, is simple. Light is an electromagnetic wave (note that all of this is taking the classical view of light, so the concept of "photon" does not appear; but nothing in the quantum view of light affects the argument being made). The EM waves we observe vary in both space and time, and in free space they travel at speed c.
If it were possible for an observer to move at the same speed as such an EM wave, then to that observer, the wave would appear to vary in space only, not time. However, there is no such solution of Maxwell's Equations. So the possibility of moving at the same speed as an EM wave is inconsistent with Maxwell's Equations. Everyone else who realized this (which includes at least Lorentz and Poincare, IIRC, but I'm sure there were others as well) assumed that the way to fix this inconsistency was to modify Maxwell's Equations. One way of expressing the inconsistency is that Newtonian mechanics is Galilean invariant, while Maxwell's Equations are Lorentz invariant. The basic idea of everyone except Einstein was to figure out a modified version of Maxwell's Equations that would be Galilean invariant. Einstein, however, took the other option: he kept Maxwell's Equations just as they were, and figured out a way to modify Newtonian mechanics to make it Lorentz invariant. The result was special relativity. And as we know now from more than a century of experimental confirmation, that was the right choice. Are we saying that the photon has no inertial reference frame, or no ___ reference frame? P.S. WP: Lorentz covariance § Lorentz violating models may or may not be interesting, wrt this whole conversation. No reference frame, as the term is technically defined in relativity. Most SR textbooks don't go into this, but many textbooks on GR do. The technical definition is that a "reference frame" (more precisely a "frame field") is an assignment of a set of four orthonormal basis vectors to each point of a spacetime (with some requirements regarding continuity, differentiability, etc.). Any orthonormal basis in a spacetime must consist of one timelike and three spacelike vectors; it's impossible to have one containing any null vectors (for the obvious reason that null vectors have zero length and therefore cannot be normalized). It is possible to have a coordinate chart in which a photon's worldline has constant values for three out of the four coordinates. However, such a coordinate chart does not correspond to any reference frame. > No reference frame, as the term is technically defined in relativity.
? Is it just 100% redundant? > It is possible to have a coordinate chart in which a photon's worldline has constant values for three out of the four coordinates. However, such a coordinate chart does not correspond to any reference frame. You'd have to ask Ron. He might simply have been thinking in terms of the usual presentation of SR, which focuses on inertial frames. He noted that outside of black holes you have three spatial coordinates and one time coordinate, while in a black hole you have three time coordinates and one spatial coordinate. If he said that he was wrong, unless he was talking about some weird coordinate chart that nobody has ever heard of (and see further comment below). In standard Schwarzschild coordinates, which are the ones where "swapping" of coordinates is usually talked about, there are three spacelike and one timelike coordinate both outside and inside the horizon; the only thing that switches is which one is timelike (it's t outside the horizon and r inside the horizon). Are you sure you aren't misremembering what your old boss said? Further comment: AFAIK it is impossible to have a coordinate chart on a 4-d spacetime with more than one timelike coordinate, because it's impossible to have a set of four linearly independent basis vectors that includes more than one timelike vector. But I'd have to look up references to verify. AFAIK it is impossible to have a coordinate chart on a 4-d spacetime with more than one timelike coordinate, because it's impossible to have a set of four linearly independent basis vectors that includes more than one timelike vector. Scratch this part, I realized I was forgetting that linear independence is a much weaker condition than this. However, my statement about any coordinate chart with three timelike coordinates on Schwarzschild spacetime being a weird one that nobody has ever heard of stands. BTW, I learn this stuff very differently from basically every other human I know about (perhaps with one exception—a friend who got her PhD from Caltech working on physical computing), and I get constantly corrected in insulting ways in the process of learning it. The jury is out on whether I'm actually learning it or just constructing sophisticated just-so stories in my head. However, if in fact I am learning it in a really weird way, I will have massive textual evidence of … people making it harder than necessary to learn it. We shall see! I strongly suspect he was referring to the "swap" between t and r in Schwarzschild coordinates (i.e., which one is timelike outside vs. inside the horizon). But it's easy enough to confirm if you see him. "So Einstein was an idiot..."
The odds of any statement beginning with those words being true are not *quite* zero, but they are damn close. A public service announcement for those of you awaiting the Big Reveal: it turns out that this experiment has even more subtleties to it than I originally suspected! I am currently in a fairly deep rabbit hole of papers and correspondence because I want to make sure that when I give the answer that I get it right. You guys can be a tough audience. My guess is some variant of #2: You might be able to have multiple particles interfere with each other. If you want a single particle to interfere with itself, you need to arrange it so the different paths take the same amount of time, so the different parts of the same particle arrive at the same place at the same time. So I think if you send one particle at a time ("laser is dim enough"), and the paths take very different times, then you won't see interference. I don't think this violates my (layman) understanding of QM. > "So Einstein was an idiot..."
> The odds of any statement beginning with those words being true are not *quite* zero, but they are damn close. Hmmm, are you under the impression that you [almost?] never employ locuations in any way comparable to what I did? Also, IIRC Einstein was an idiot in a decent amount of what he said outside of his area of competence. But again IIRC, he was somewhat unusual in that he generally qualified those statements and didn't expect to have his narrow scientific authority translate to authority in those other domains. > My guess is some variant of #2: You might be able to have multiple particles interfere with each other. If you want a single particle to interfere with itself, you need to arrange it so the different paths take the same amount of time, so the different parts of the same particle arrive at the same place at the same time. So I think if you send one particle at a time ("laser is dim enough"), and the paths take very different times, then you won't see interference. I don't think this violates my (layman) understanding of QM. Is this compatible with the results of the delayed choice quantum eraser? My old boss texted a long description of a modification of it which may be critical for it to be incompatible with the bold; if so I'll have to ask him to draw me a diagram instead of try and describe it in text when I'm next in Pasadena (in a few weeks). Actually, I should not have been quite so glib with that "nope" since you hedged with "some variant of..." It turns out that it matters *how* you make the laser dim. But the usual ways (turn down the power, put in a filter) all preserve the interference. > are you under the impression that you [almost?] never employ locuations in any way comparable to what I did? Why do you think that matters? I'm not the one lamenting that "I get constantly corrected in insulting ways." Doesn't figure 3a at WP: Michaelson interferometer answer your question? I don't see how time-of-flight issues matter, as you already have that with two-slit interference. Now, the phase difference of the green signal at the detector will become more spatially homogeneous as D2 ≫ D1, so I should think that the interference pattern would no longer have [nearly] pure voids. But you should still see a pulsating variation in the interference pattern. An example (where D2 ≈ D1) can be seen at https://www.youtube.com/watch?v=j-u3IEgcTiQ#t=34s . P.S. There is also WP: Fourier-transform spectroscopy § Continuous-wave Michelson or Fourier-transform spectrograph seems to have an experimental setup quite like yours, except the detector is one-dimensional and there is only one fully-silvered mirror at each end instead of two (but I don't think that matters?). > I don't see how time-of-flight issues matter, as you already have that with two-slit interference. The question is what happens when the time difference is very large? Take an extreme case: make the time difference between the arms be a full minute, and make the laser dim enough that the individual photons arrive ten minutes apart. > seems to have an experimental setup quite like yours, except the detector is one-dimensional and there is only one fully-silvered mirror at each end instead of two (but I don't think that matters?). That's right, it doesn't. I only used the two mirrors at 45 degrees to make the paths easier to follow in the drawing. @Luke: "Is this compatible with the results of the delayed choice quantum eraser?" As far as I can tell, you only observe interference, where there are multiple possible paths that take the same amount of time. This seems to be true in your "delayed choice quantum eraser" setup as well. In contrast, it clearly isn't true in Ron's setup. Ron's red path is much shorter than his green path. > > I don't see how time-of-flight issues matter, as you already have that with two-slit interference. > The question is what happens when the time difference is very large? Take an extreme case: make the time difference between the arms be a full minute, and make the laser dim enough that the individual photons arrive ten minutes apart. I still don't see why it should make any difference. Again, there is time-of-flight difference in the two-slit experiment on the left and right fringes. Same with the video I just linked to. Why would more difference all of a sudden break things? Light propagates as a wave and interacts as a particle. Maybe I intuitively think in terms of pilot waves and as a result don't see the ostensible paradox that you do? We use this capability to make the distance traversed by the photons on the green path be much larger than those on the red path, large enough that there is an easily measured difference in the travel time between the two paths. On re-reading, I have a question about this. Is the intent that the laser pulse itself is of very short duration (basically much less than both T1 and T2)? It would seem that that would be necessary to create the issue you are describing. As I pointed out before, you can't think in terms of pilot waves if you're dealing with photons, because the pilot wave interpretation is non-relativistic and photons are inherently relativistic. More precisely, as I just said in my previous post, you can't think in terms of pilot waves if you're dealing with the spacetime degrees of freedom of photons. If you restrict yourself to just talking about their spin degrees of freedom (i.e., treating them as abstract qubits without even looking at their spacetime behavior), then you can think of them non-relativistically and use the pilot wave interpretation (though that interpretation doesn't do much for you in terms of just spins); but the experiment Ron is proposing requires an analysis that includes the spacetime degrees of freedom. By the time the red-path-part of the photon arrives at the detector, the green-path part is still en-route to the distant mirror. Likewise, by the time the green-path-part of the photon arrives at the detector, the red-path part is long gone. I'm not sure I agree with this analysis. If you run a standard interference experiment with single photons (i.e., with the intensity down so low that there is only one photon at a time inside the apparatus), you don't see an interference pattern right away. You see individual photon impacts on the detector. The interference pattern, if there is one, shows up in the pattern of many impacts. In this experiment, it seems to me that making the time of flight difference large enough amounts to a which-path measurement of the photon; in other words, if T2 is large enough compared to T1, then you will either see a photon impact in T1 plus epsilon, or T2 plus epsilon, but never both. And those two final states are distinguishable, because epsilon will be much smaller than the difference between T1 and T2, so there should be no interference, for the same reasons that interference is not seen in any experiment where a which-path measurement is made. This amounts to your answer #1. However, I'm not sure that is actually inconsistent with "standard electromagnetic theory", because I think standard electromagnetic theory would model the output of the laser as a wave packet with a finite "width" in time, which, as I noted in a previous post, should be much shorter than T1 or T2. For that case, standard EM theory would not predict interference. > Is the intent that the laser pulse itself is of very short duration (basically much less than both T1 and T2)? It would seem that that would be necessary to create the issue you are describing. 4. What I think is the most interesting scenario: the one where the laser is pulsed and the timing coincides with T1 and T2. For example, let T2 = 2nT1 for some integer n>1. Then turn the laser on for T1, then off for T1, then on for T1 etc. That's the one that still has me scratching my head. Ah, ok. This clarifies things and gives me a lot more to think about. :-) I think I was basically assuming #3 in my previous post, but somewhat conflating it with #2--but you're right, those are different cases. On a quick skim, it looks like the "singe photon" states they are describing are not the same as states that would be emitted by a laser. A laser emits coherent states; those are not eigenstates of photon number (so when we talk about a laser's intensity being set to emit "one photon", we really mean the expectation value of photon number is one, not that it's in an eigenstate of photon number with eigenvalue one). But it looks like the cavity states they are talking about are photon number eigenstates, which have very different properties. I need to read the paper more thoroughly, though. > As I pointed out before, you can't think in terms of pilot waves if you're dealing with photons, because the pilot wave interpretation is non-relativistic and photons are inherently relativistic. if I ended up getting the right answer (my attempt), what do we do if in fact that I used a bastardized version of pilot waves to get there? It means you were lucky. Don't count on being lucky too often. > > if I ended up getting the right answer (my attempt), what do we do if in fact that I used a bastardized version of pilot waves to get there? > It means you were lucky. Don't count on being lucky too often. And if I do get "lucky too often", as judged by the criticism/​insult flux per ultimately [sufficiently] correct belief? Might that indicate an error in the criticism/​insult generators? Or empirically, using the most rigorous of reasoning that humanity has to offer, would I still just "lucky"? And if I do get "lucky too often", as judged by the criticism/​insult flux per ultimately [sufficiently] correct belief? > > > > if I ended up getting the right answer (my attempt), what do we do if in fact that I used a bastardized version of pilot waves to get there? > > > It means you were lucky. Don't count on being lucky too often. > > And if I do get "lucky too often", as judged by the criticism/​insult flux per ultimately [sufficiently] correct belief? > Let me know if that actually happens. Ahh, so you don't want to bind yourself to some interpretation or class of interpretations before the fact? You know why I'm trying to get you to commit to something before the [possible] fact, right? > And if I do get "lucky too often", as judged by the criticism/​insult flux per ultimately [sufficiently] correct belief? Because this puzzle has only two possible answers (interference/no-interference) you have a 50-50 chance of getting it right by examining chicken entrails. But I would not be particularly impressed by that. so you don't want to bind yourself to some interpretation or class of interpretations before the fact? I don't think Ron's question has anything to do with interpretations of QM. It's a straightforward question of what the math of QM predicts. You know why I'm trying to get you to commit to something before the [possible] fact, right? I have no idea. Nor do I have any interest. In your face, liberal haters!